Steel construction’s speed of delivery has recently come to the fore, as an 830-space multi-storey car park for media company Sky had its frame erected and flooring installed in just eight weeks. Steel tonnage: 1,200tSky’s campus in Osterley, west London is undergoing a major expansion with new office buildings [see previous article] and a new multi-storey car park both being constructed at the same time, albeit as separate contracts. 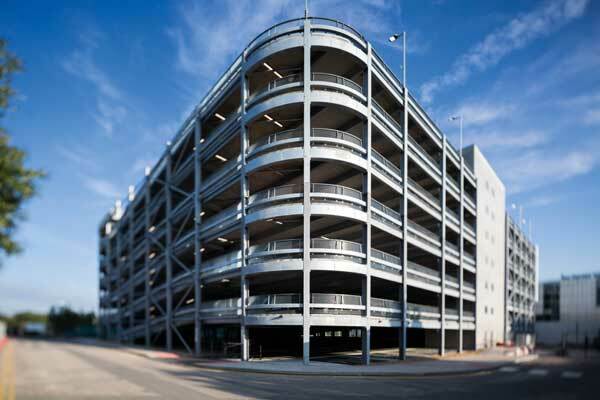 For the car park, Bourne Parking was the main contractor and steelwork contractor, fulfilling both tasks on this fast programme. “Normally the build programme would be much longer, but the client wanted the car park as quickly as possible, so with four cranes working simultaneously for the steel erection we were able to achieve this fast programme,” explains Bourne Parking Senior Project Manager Greg Brown. The car park measures 90m-long by 50m-wide and consists of seven levels, including ground floor and an open rooftop level. The structure is a steel braced frame that supports precast flooring planks, with steelwork erected around a 7.5m by 16m grid pattern. Prior to Bourne starting on site, the plot for the car park had already been cleared with an old office block demolished under a separate contract. Once the piling and the installation of ground beams had been completed, as well as the construction of two precast cores, the steel erection programme was able to begin. “Using four mobile cranes was a challenge as the structure takes up the entire site’s footprint leaving no room for material storage,” adds Mr Brown. Erecting the structure to its full-height, as well as installing the flooring planks, two cranes were used to erect the area incorporating the car park’s ramps as this had a higher degree of complexity and a higher piece count, while the rest the building was divided between the other two cranes. Stability is derived from strategically positioned cross bracing, located in areas that don’t interfere with parking bays, and the diaphragm action derived from the grouted floor planks. Some additional temporary bracing was also necessary during the steel erection process. “The steel frame had to be extra rigid as it has to go around and incorporate two structurally independent precast buildings that are located on the ground floor,” adds Mr Brown. These two buildings consist of a substation for electric car charging, and an office and pump room. Once the steel frame had been completed, Bourne fitted out the car park, work that included M&E, installation of lifts, and asphalting and waterproofing the upper level. The car park was then handed over to the client, on time and within a 30-week schedule. 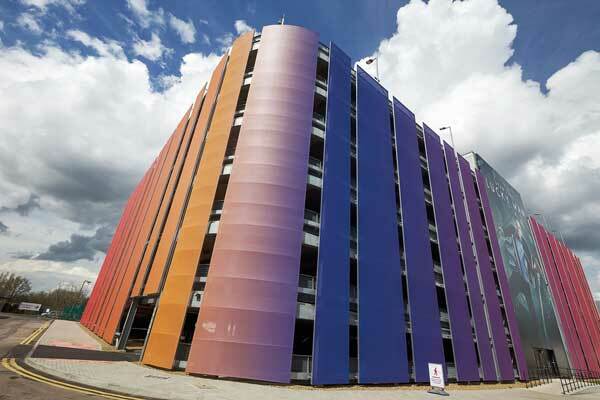 While it was in use the distinctive rainbow coloured cladding was installed. A team of abseilers undertook this work as they required less plant on site and consequently caused little or no disturbance to car park users.